Dusty iceballs left over from the birth of the Solar System, comets are most famously known for their tails: long diffuse veils of ejected gas and reflective frozen material streaming out from their nucleus millions of miles away from the Sun. And even though we’ve typically been seeing it as a rugged rubble pile, Rosetta’s comet 67P/Churyumov-Gerasimenko is jetting material out into space – as seen in this beautiful contrast-enhanced OSIRIS image acquired on November 22. 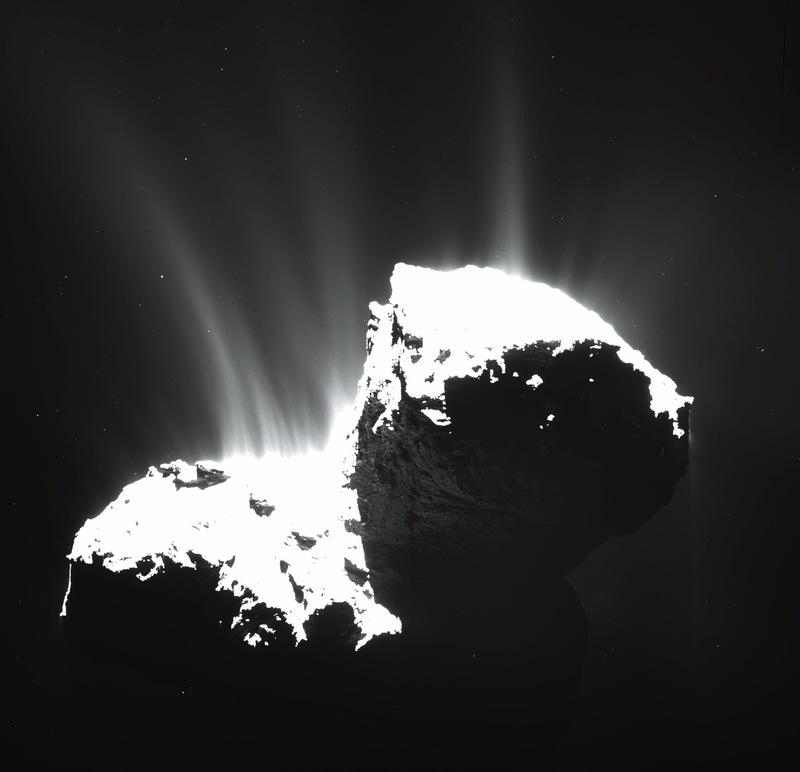 The closer comet 67P gets to the Sun, the more active its jets will become as volatile material beneath its surface is warmed and sublimates. Currently over 517 million km away, 67P will reach perihelion on August 13. Captured from a distance of 30 km from Comet 67P/C-G, the image resolution is 2.8 meters per pixel. Unlike NAVCAM images, which are released fairly regularly by the Rosetta team, high-resolution OSIRIS images are managed by a different organization and are released to the public much less frequently. As such, every one is seen as a treat by space fans! Read more on the Rosetta blog site here, and click here for real-time data on comet 67P’s position.